1 Preheat your oven to 200°C/fan 180°C/gas 6. Put the onion, celery, carrots and garlic in a large frying pan with a mug of water. Cook over a medium heat for 8-10 minutes, or until everything is softened, adding a little more water if needed. 2 Meanwhile, cook the spaghetti according to the pack instructions, then drain well. 3 Stir the tomato purée, dried Italian herbs, 1 tsp dried rosemary, the passata and vinegar into the vegetable mixture. Bring to the boil, then simmer for 5 minutes. Tip into a large baking dish, then stir in the spaghetti and tomatoes. 4 Spray the chicken with low-calorie cooking spray, then sprinkle a quarter of the Parmesan over each fillet with the remaining dried rosemary, and season. Space out the chicken on top of the spaghetti and bake for 15 minutes, or until the chicken is cooked through. 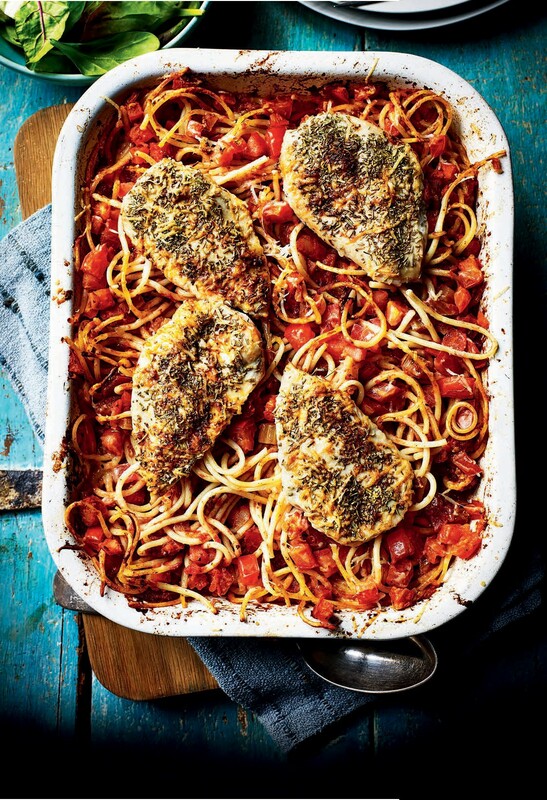 Serve 1 chicken breast per person with the spaghetti and salad.